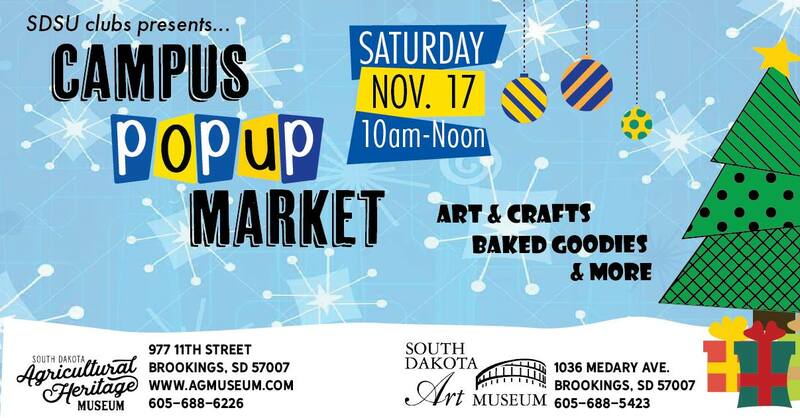 Visit the SD Agricultural Heritage Museum and South Dakota Art Museum on November 17 (10 am - 12 pm) to shop museum sales and support SDSU Student Organizations and Clubs. Participating student groups will have booths featuring their respective fundraising items. Find that special gift at the SDSU Campus Popup Market this holiday season. SDSU Clubs selling SDSU cheese boxes, baked goods, Native American beadwork and more at the Agricultural Heritage Museum and the South Dakota Art Museum. Below is a list of the clubs and departments that are participating. This event is being held at the South Dakota Agricultural Heritage Museum (977 11th Street, Brookings, SD 57007 | 605-688-6226) and at South Dakota Art Museum (1036 Medary Ave.). Free parking is available at both locations. Parking for South Dakota Art Museum is located just west of the museum on Harvey Dunn Street (no need to get a pass when you check in at the front desk). Parking for the Agricultural Heritage Museum is located next to the museum.